If you’re building your first home, you know many decisions need to be made – choosing a reputable builder, deciding on the home’s layout, selecting flooring and countertops, and everything in between. Fireplaces are in a category all their own; no other amenity comes close in terms of adding coziness and atmosphere to your home. That’s why we hesitate to call fireplaces “appliances.” They offer so much more than functional benefits of heat and warmth: fireplaces make dream homes complete. The best time to incorporate a fireplace (or two) into your home is when you’re building it. For one, the fireplaces can be rolled into the mortgage along with the rest of the amenities. For two, you have full control to choose the very best locations for them within in the home. And last but certainly not least, you can choose from a wide variety of fireplace models and get what you really want. Make sure to choose a gas fireplace that has a protective screen over the glass. Screens reduce the risk of serious burns by creating a barrier that prevents skin from coming into direct contact with the hot glass. Keep in mind, however, that screens can also retain heat, so touching them isn’t advised. 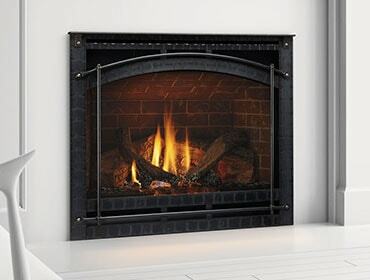 All Heatilator gas fireplaces are outfitted with factory-provided protective safety screens. For more information about fireplace safety and Heatilator’s safety screen program, visit http://www.heatilator.com/Fireplace-Safety.aspx. Whatever your home style preference, Heatilator has plenty of fireplace options to suit your fancy. You may be most familiar with traditional style fireplaces, which are popular with many homeowners and replicate wood-burning fireplaces with realistic logs, flames and embers. Meanwhile, modern style fireplaces, which feature pebbles, stones, or colored glass crystals in place of log, are quickly gaining popularity. They still provide all the same heat qualities as traditional style fireplaces, but come in different sizes and shapes, and with features like unique flame designs, LED back-lighting and sleek finishes. The Heatilator Caliber nXt offers traditional ambiance with realistic logs and bold flames that fill the large viewing area. On the Heatilator gas fireplace product page, you can see all the options. And in this recent blog, we explore the many options for designing around your beautiful new fireplace. Check it out. And here’s one thing every new homeowner should know… the value of your efficient gas fireplace.